Located on the foothills of scenic Aravali Hills and surrounded by greenery and natural beauty; Jeevantara Club & Resort, Udaipur is an ideal place to plan your vacation. This luxury hotel is designed on the basis of contemporary design traits and therefore has very lively and warm feel and appeal to itself. 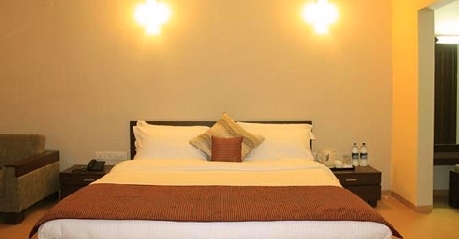 The hotel offers five basic accommodation option i.e. Standard, Deluxe, Executive, Pool View and Family rooms; in line with the diverse clientele it has. 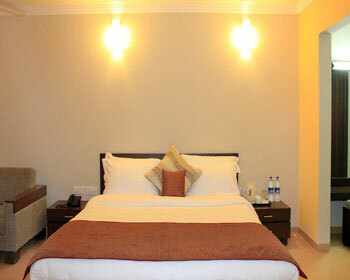 All the rooms are fitted with premium amenities that offer it a very lavish aura and ambience. Jeevantara Resort also boasts of a multi cuisine restaurant and a Bar as well as a tea lounge, which keeps the taste buds of patrons satisfied. In addition to this, the general hotel facilities at Jeevantara Resort include 24 hour Front Desk, 24 hour In-Room Dining, Gymnasium, Swimming Pool, Airport and Station Services available on Request, WiFi in the Lobby and lounge areas, Laundry Service, Valet Service, Meeting & Event Facilities, Party Lawns, Discotheque and many others. Warm hospitality, unmatched amenities and mesmerizing view, the property has every ingredient to make it a prefect vacation destination for solo, group and family travelers. 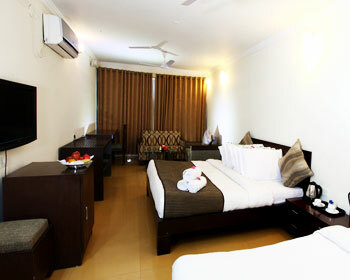 Standard Rooms are simple yet comfortable rooms are designed to cater to solo and business travelers. 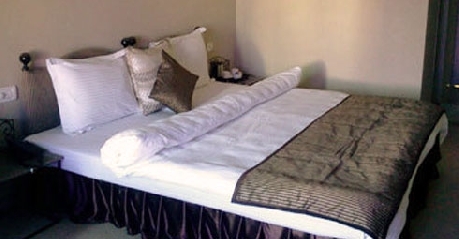 Furnished with a very comfortable bed and sitting arrangements, the Standard Rooms are very convenient to stay in. These rooms offer complete comfort and convenience to patrons through different facilities and amenities that are included as part of it. These are LCD flat screen television with satellite connectivity and premium channels, 24 hour in room dinning service, mini bar, in room electrical kettle for tea and coffee, daily housekeeping service, complimentary mineral water bottle, complimentary high speed internet service, complimentary newspaper, same day laundry service and many others. Patrons can also be provided with extra beds on request. 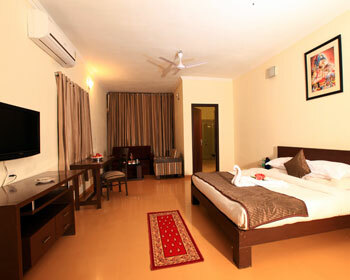 Executive Rooms are premium rooms that are available at theJeevantara Club Resorts, Udaipur. Equipped with best in class amenities and facilities, these Executive Rooms have earned rave reviews from both local as well as foreign guest. Tastefully designed décor coupled with the warm and lively feel of the room makes it a perfect accommodation choice for comfortable vacation. The long list of in room amenities included as part of Executive Rooms include Ironing Board, Bathroom Toiletries, Room Service, Air Conditioning, DVD Player on Request, Room Heater, Geyser in the Bathroom, Study Table, Sofa Unit, Refrigerator, Cable T V, Intercom Facility, Balcony/sit Out, Shower Area, Hot/cold Water, Iron, Dinning Table and high speed Internet access. 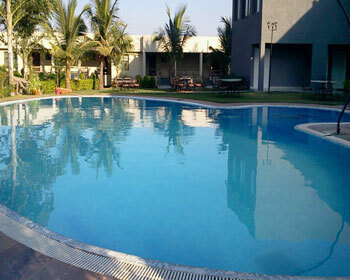 Enjoy the serene view of the swimming pool right from your room by choosing to stay at the Pool View Rooms at the Jeevantara Club Resorts, Udaipur. The rooms have very contemporary décor which is further enhanced by the view of the pool. Equipped with extra large King Size bed, sitting furniture and dinning setup, the Pool View rooms are sure to take care of any and every need of the clients. The rooms are fitted with premium room amenities which includeStudy Table, Sofa Unit, Bathroom Toiletries, Room Service, Air Conditioning, DVD Player on Request, Room Heater, Geyser in the Bathroom, Ironing Board, Refrigerator, Cable T V, Intercom Facility, Balcony/sit Out, Shower Area, Hot/cold Water, Iron, Dinning Table and high speed Internet access. All the amenities and the mesmerizing view make it a prefect package for a vacation stay. As the name suggest, these Rooms are aimed at offering spacious and comfortable stay to group travelers and families who want to stay together and spend some quality time. In addition to this the modern design traits give the rooms more lively and warm feel and appeal. The spacious rooms are fitted with classy furniture and premium fitting to give it a very up market free. Patrons will get very comfortable bed; sofa set unit and a dinning setup as part of the room. The long list if amenities included as part of the Family rooms include complimentary high speed internet service, 24 hour in room dinning service, mini bar, in room electrical kettle for tea and coffee, satellite connectivity and premium channels, daily housekeeping service, complimentary mineral water bottle, complimentary newspaper, same day laundry service and many others. Patrons can also be provided with extra beds on request. 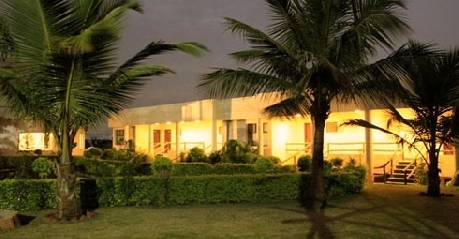 Jeevantara Club & Resorts, Udaipur, Kochi offers executive and elegance rooms with single/ double bed facilities. All rooms and suites are air- conditioned, spacious, clean and aesthetically decorated. Banquet hall Baithak and Bhaitak-2 are also on site with capacity of approx 90 people. This hotel has all contemporary facilities and amenities that one traveler desire to find while away from home. To cater to its diverse clientele, Jeevantara Club & Resort has developed an in house multi cuisine restaurant. 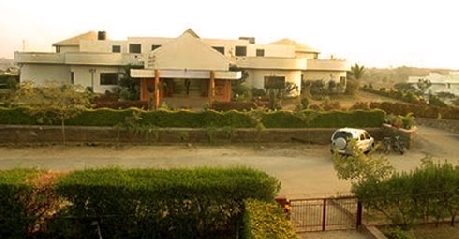 The contemporary ambience and warm hospitality makes patrons feel very welcome to this place. The décor is done adorned with contemporary furnishing and therefore gives it a very modern feel and appeal. The eatery specializes in exotic Indian, Continental as well as other popular dishes from global cuisines to serve the taste buds of clients. There is a garden barbeque setup also, where clients can enjoy starters and snacks in the scenic greenery of the place. Patrons are advised to try local Rajasthani cuisine items that are prepared as per traditional recipes and therefore have a very unique taste and flavor. The amazing setting and mesmerizing food make this restaurant one of the best in Udaipur. If you are the kind of person who like to be in right spirit at the right time, than Shots is the place for you. The Bar is very lively place to hang out with friends or for a casual date. The overall ambience with enticing music and lights makes it a must visit place. Shots has a well stocked bar that serves popular spirits, cocktails, mocktails and even other non alcoholic drinks to keep the party going at the Jeevantara Resort. Patrons can also try the snacks and finger food that goes perfectly well with the drinks. If you like to enjoy your tea with a touch of class, than head to Tea Lounge! The place serves number of hot beverages and snacks for those ill timed hunger pangs. Be it evening or late afternoon, patrons can always hop in for a bite and they will not be disappointed by the Tea Lounge.